Today we found 11 cents in the form of a very dirty dime and one penny. 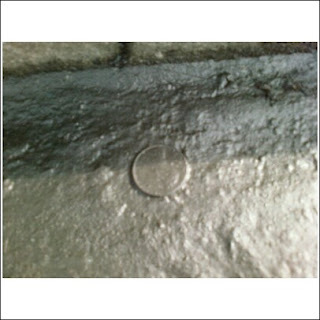 The dime was uncovered during one of our walkabouts at a nearby park right off Bay Street (see image below). The weather is getting much better so we'll be walking around much more to get some family exercise after dinner.. i can't wait!!! Today I found a dime at the gym this morning. I spotted three pennies in the street but Jamaica Avenue is a pretty dangerous place to retrieve coins! Today we found a total of 39 cents in the form of a quarter, a nickel, and nine very corroded pennies (dirt pennies). I find it incredibly interesting that we found a quarter and a nickel for two days in a row- seems like the quarters are making a comeback! Happy St. Patrick's day!! Got your mug of ale yet? 1896 Premiere of Mahler's "Lieder eines fahrenden Gesellen"
Today we found a total of 53 cents in the form of four dimes, a penny, and eight nickels. I'm shocked at how many dimes have surfaced in the past couple of days- no quarters in sight! 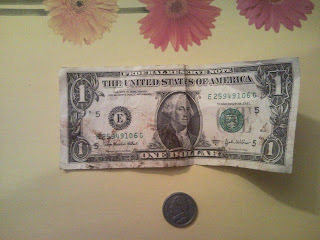 Hubby found most of the change during early morning PT in the dirt (gotta love 6am exercise!) The rest was found while taking a trip around the mall. Today we found a total of $.98 in the form of two quarters, four dimes, and eight pennies- breaking the $80 mark of Changepot's fourth year! The quarters were found in the change return slot of a vending machine on campus (woohoo!) 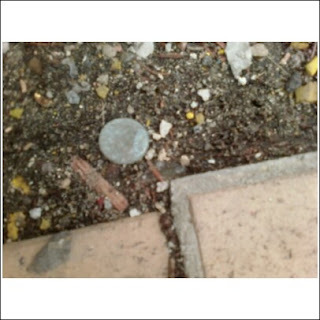 The dimes and pennies were found scattered around outside and in the mall. Right now we're in the process of updating our home theatre system to promote more at-home entertainment for the colder days until spring weather sets in. Today we found $1.23 in the form of a dollar, two dimes, and three pennies. We cashed in a total of $3.80 in bottles that we collected and had tucked away since the summer during our beautification stint. I can't believe how many bottles we found discarded on the boardwalk- 75 in total! Goodbye balcony clutter! The +5 by the total amount on the title was today's very first find- a fake nickel!! We've added it to the non-changepot (where we currently keep the foreign coins, broken jewelry, and ripped dollar bills). The dollar we found was pretty dirty (see picture below)- so dirty that we have placed it into a ziploc snack bag and added it into the changepot. Today we found a total of 43 cents in the form of three dimes, two nickels, and three pennies- thanks to the fine folks walking around and shopping happily at the Jersey Gardens Mall. Bri's best find of the day was the three dimes and a nickel over by the relaxation chair station (Ka-Ching!). At this rate, we'll be seeing $80.00 in no time! 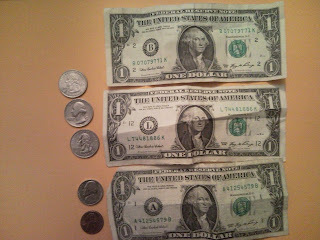 Today we found a whole mess of change- five dimes and twelve pennies in total. All of it was found during our random outings all over Staten Island today. Hopefully when the weather gets warmer we'll go out and take in some scenery as we 'hunt'. 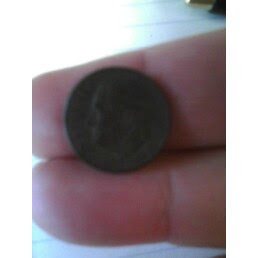 Today we found a total of 21 cents in the form of a dime, two nickels, and a penny- BLACKJACK! 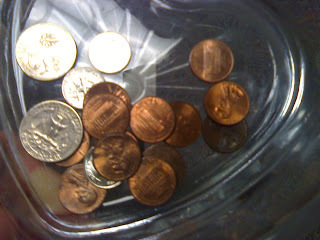 Hi Barb, I was picking up pennies by the vending machines today and realized I was building up quite a collection. Some people drop quarters, nickles and dimes also. Hello money finders, My name is Bobby Eason. I just found your website. Congratulations on your interesting family hobby. This January, I started a blog site called MoneyWalker. My blog address is as follows: http://MoneyWalker.blogspot.com/ I would appreciate you listing my blog on your homepage of listed blogs. My goal is to use the external motivation of finding lost money as a reason to persevere in the healthy habit of walking for fitness. About half of my entries deal with physical fitness and the other half with tips for finding money while walking. My blog is an infant and I am seeking ways to improve it. Again, I really enjoy the way you are teaching great American values to your family. Loved your site. I've been picking up money off the ground my entire life. About 25 years ago I started my own Christmas newsletter as a sarcastic swipe at Christmas newsletters and talked about important things like my dentist visits and the money I found. I call it "free range coinage" and started a Free Range Coinage Club and every time one of my family or friends tells me that I inspired them to pick up money I let them know they too are now in the club. Glad to see I am not alone in the world! 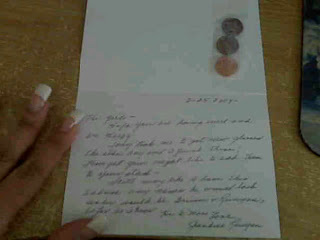 The letter had three pennies taped on it! I'll add them lovingly to today's post as we've found nothing yet but we haven't given up hope. Once the snow melts I'm sure we'll find lots of corroded pennies and nickels to pick up! We didn't go out today so logically there are no finds to report.